Preheat oven to 375 degrees F (190 degrees C). Grease a 9 x 13 inch baking dish. Unroll the dough; separate into 8 triangles. On the large end of the triangle place 1/2 piece of American cheese and 1/2 cup of shredded chicken. Roll the dough and seal the edges. Place in prepared dish. 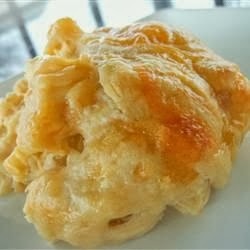 In a small bowl combine the soup, milk and Cheddar cheese; pour over the stuffed rolls.